It's possible that you've read my lament about how 2015 has been a year of quite a few good records. Some of them have been very good, but what I think 2015 has been lacking so far is drop dead great records. The instant album of the year contenders. It may have taken until November to get there, but please everyone welcome Clearance. They have not only created a great record, but as it stands right now, I'm calling it and saying this is the best record of 2015 so far. There's only a month and a half left in the year, but it's going to take a hell of a record to knock Clearance out of my top spot. A recurring theme for me is that I tend to favor bands that have a 90's leaning sound. I think that the music you listen to in those formative late high school/early college years becomes your base and there's always a part of you looking for sounds that excite you in the same way. Clearance has that in spades. Not only does this record knock me off my socks now, I'm positive they would have been just as much of a heavy hitter in 1995 as well. Clearance is playing the sort of warm, jangly indie rock that I adore. Vocally they're very reminiscent of Pavement with a talking sort of delivery and obtuse lyrics. On the music side, while you can get hints of Pavement there as well, I tend to think that Clearance pulls together a slightly tighter sound. It's more deliberate, not as ramshackle and doesn't drift out into weirdo noise freak-outs as Pavement was wont to do. Rapid Rewards is thirteen songs of glorious mid tempo pop. I dare you to listen to the churning rhythm of "You've Been Pre-Approved" or the bright, cherry guitar part making up the bridge of "Rather Not Bother" or the fuzzy background squall of "Swiftboating (Onto The Reels)" and not be blown away. 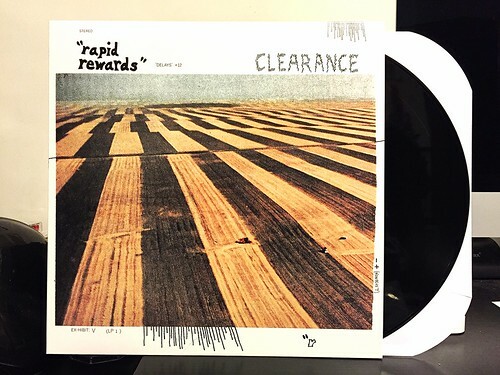 I had very nice things to say about both of Clearance's prior 7"s. Those were some great songs and are absolutely worth picking up. But man, Rapid Rewards is light years ahead of those records and is without a doubt the best record I have listened to all year. See you in December for the Absolute Best Records of 2015 list. I'm saving a spot for Clearance right at the very top.